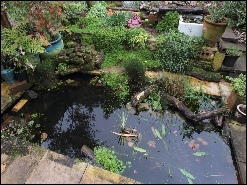 After the destruction of a number of ponds in my local area Wirral in the Northwest of England due to commercial development, I decided to build a pond in my garden and populate it with Frog spawn that I collected from the doomed ponds. The exercise was a success and I added to the gene pool when a local garden centre offered Frogs spawn free to good home. After a number of years I have a large and thriving Frog community. 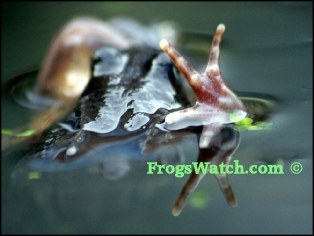 I have photographed since 2003 and they have been the main prompt for me to build FrogsWatch.com . The photographs are displayed on these Web Pages, along with some additional information that I have gathered. All the frogs are the ‘Common Frog - Rana temporaria’ . 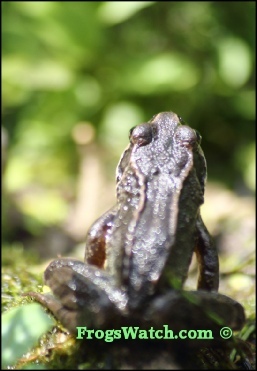 Sound file added , listen to the sound of the common frog. Photographing the Common Frog since 2003. 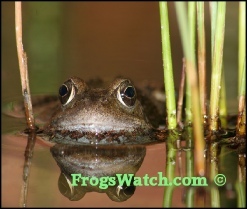 With a few exceptions and except were credited all the images of the Common Frogs on this web site were taken in the same suburban garden in the North West of England. Pond and Frog experiences from FROGS-WATCH visitors. it is always interesting to hear from Frog fans about their Frogs and other creatures in their gardens. with the decline in natural habitats the suburban garden has become an important refuge for all types of wild life. To sustain our wildlife friendly gardening needs to be encouraged with methods for creating a helpful environment for creatures to survive.